IPVanish is still a newcomer on the market, but has quickly grown a respectfully large tier-1 network providing global coverage with direct encrypted routes across 60 countries and counting. The company was first built by enlisting the help of various technical experts with as much as 15 years of experience each in the fields of networking, encryption and security. Being a zero-log service, it fully supports P2P, and promises to deliver minimal speed loss. With decently priced plans allowing 5 simultaneous connections each, IPVanish has a competitive offering, but does it perform as promised? 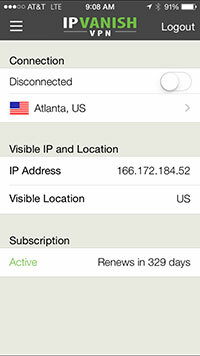 IPVanish comes in at what I would consider a medium priced VPN provider, but what does that even mean? I get my own perception of cost after having tested and signed up to over 30 VPN services on my own! So let me say this. It’s somewhere between the most expensive and cheapest VPN providers, but easily one of the best value per cost services I have tested. With up to 5 simultaneous connections per account on all plans, it can be an affordable service for families or techy users who just have lots of computers. This was just recently increased from a limit of just 2 devices per account. Bitcoin is accepted as an anonymous payment method. If you’re unhappy with the service, IPVanish offers a 7-day money back guarantee with no usage limits. This allows you to properly and freely test the service on any plan before committing to it. 1 Month: $10.00 USD per month. 3 Months: 8.99 per month – Total $26.99 USD. 1 Year: $6.49 per month – Total $77.99 USD. IPVanish runs their own impressive tier-1 service with an infrastructure of over 500 severs across 60 countries and almost 100 cities. Just two years ago, the service maybe had a little over 100 servers. More than 40,000 shared IPs are used to anonymize sessions. Their zero-log policy allows you to safely transfer data through P2P torrents, and there are no service usage limits of any sort. IPVanish shines when it comes to simple, easy to use software. Setup was a breeze, select a plan, verify your email and download the software. The server list is neatly displayed with response times to allow you to find the fastest network available. You can quickly pick from OpenVPN with UDP/TCP, L2TP and the less recommended PP2P protocol at the bottom of the window right next to the connect button. Apple iOS users have IKEv2/IPSec protocols for the best possible encryption. The software works well across all platforms, and remains just simple to use from one to another. The server list provides live ping time responses to help you find the quickest routes for your needed location. It’s well laid out, easy to select and connect, as well as monitor network performance through their diagnostics tab. Android and iOS clients have been available almost since their start. Everyone knows that the internet is seeing a huge paradigm shift in the form of mobile computing. Certain estimates correctly predicted the shift of web browsing done on tablets and smartphones being higher than on PCs. With more and more computing being done via mobile device it stands to reason that more and more business is also being done on your mobile devices. As phones went from being casual time wasters, to indispensable parts of our daily lives people have grown more and more concerned than ever before about how private their mobile data really is. IPVanish has been at the forefront in terms of mobile client support. They’ve also put a lot of work into the Mac OS and Windows clients recently. Having its own tier-1 network with more than 40,000 shared IPs, IPVanish has continuously grown their service, more than doubling in servers and shared IP count each year. The connection is not monitored, activity is not recorded, or stored, and your privacy is assured starting immediately following your signup. The one record that is kept is a time stamp with amount of data transferred. This can come as a big relief to those of you in countries which are actively censoring or limiting the internet. IPVanish recently completed a big initiative aimed at providing users in Turkey with the resources to circumvent some particularly restrictive measures which have been adopted by the Turkish parliament. To have providers actively take an interest like that is a boost to the entire privacy movement in general. In terms of technical specifications, the standard AES 256-bit encryption over OpenVPN is used where possible. Apple iOS users have IKeV2/IPSec option offered on the app. L2TP and PPTP are available, but not suggested for the best possible security. No IP or DNS leaks have been detected on my part, but one peer user has reported in our comments section having lost security on a specific server. If this has happened to you, we welcome you to share it by leaving a comment, but so far I can confirm that the encryption has been glitch free for me on all tested servers. IPVanish, like a few others, markets itself as the fastest VPN service available, but we all know any such service claim is just marketing gimmicks. 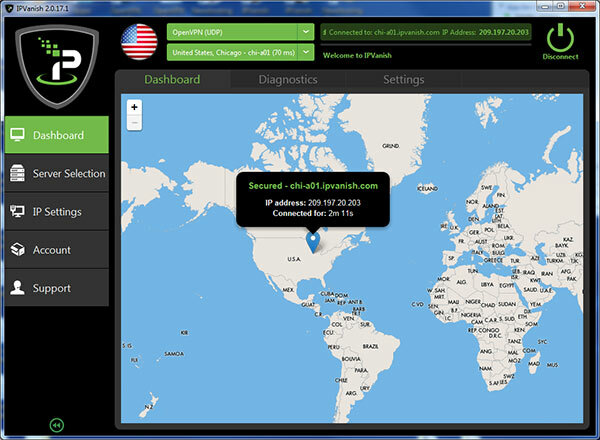 You can only get real-world results by putting a VPN to the test from your location. Having recently doubled what was already one of the largest networks on the market, and doing so year after year, what can be said for sure is that they upgrade the network regularly. This helps keep speeds up to par with growing numbers of users, and makes a yearly plan much more dependable on the long run. As far as stability goes, the servers seem to be solid for the most part, and an auto-reconnect feature in case connection ever drops. IPVanish also pushes to market to gamers and high bandwidth users like HD video streaming, or torrent downloading. Indeed, they do provide a fast service all depending on how far away you are from your connection point. Below are some speed tests that include the best response time servers mixed with slower response times. IPVanish boasts great customer service. With round the clock technical support available via email and live chat support on the website (Monday to Friday 9am to 5pm EST) you are certain to get your needed help and guidance. Additionally, they offer a detailed FAQ and Step by Step guides in text or visual guide which are available for all major platforms (Windows, Mac OS X, iOS, Android, Ubuntu and Network Routers). Updates regarding service maintenance are regularly posted on their help page. There you can also find more information regarding using your VPN with Roku, Apple TV, Chromecast, or routers in general. Overall, IPVanish improved quite considerably in the last couple of years. Early reviews showed mixed results with users saying the server connections would drop frequently, or provide sub-par speeds. As of 2016, IPVanish now have more than 500 high bandwidth servers to handle their users. They have more than quadrupled in size since the first time I used them. Speed tests are just as good if not better than the first time around, and stability does not seem to be of concern. More importantly, my favorite upgrade has been the increase from 2 to 5 simultaneous connections per account. Otherwise the service would have retained a hefty price tag comparatively to similar services. What do you think? Does IPVanish deserve a higher score? Please share your comments and results below. Above average to fast speeds. Cost of service is only competitive on yearly plans. Speed or service is sometimes reported to drop or be blocked by providers. How do I create passwords with a crazy stalker who has keylogger and can see my keystrokes. It’s so frustrating! I’m told “he would have to install it on your device. Every password vanishes. It’s impossible to keep an e-mail account. I read several reviews that put this service as #1 and decided to give it a run. I had been using PIA for a year on several devices (switching out my ISP’s gear for a gbps modem and a Nighthawk flashed with Tomato set up with whatever VPN I plan on keeping). I had no problems with PIA, but I read about some potential security issues with it’s standard clients not being OpenVPN (setting up OpenVPN on Mac OS or Windows 7 was easy, on iOS, not as much), so I wanted to try a different provider. Since these guys offered a free 7 day trial and had a highly rated iOS app, I gave them a shot. In my testing, it looks like DNS info was leaking, geo-locating was leaking, IPv6 is not auto-disabled or protected within the tunnel, it’s simply routed back to your ISP (so disable IPv6 if you use these guys). I even found that when a geo-tracker pinged me, it saw not only the IPv4 on my PC, it saw my Mac, my iPhone, and my girlfriends iPhone. My phone and PC were running IPVanish at the time, so they should not have been seen. The same checks on my iPhone (running on the same network) showed no leaks. So it seems the client runs much more securely on iOS than on Windows. In any case, I am contacting them to let them know, and see if they can give me DNS settings to replace my ISP’s with from my PC until I get my modem/router setup. So I don’t know. I didn’t have this issue with PIA, but I did with IPVanish. Hoping it was something on my PC (Windows had hardwired DNS and IP addresses into my IPv4 adapter properties that were from my ISP. So I wiped them out and set them to auto for now. Still geo-locating is leaking, but everything else looks good). I may update later, but this is something to be aware of. If you’re running this VPN directly from a router running some open source firmware (DD-WRT, Tomato, Open-WRT), then I highly doubt any of this would be an issue. But from a client on a PC – you need to check all your network adapters to ensure they’re not bleeding personal info.